Every week GOLF senior writer Michael Bamberger identifies — and ranks — the absolute, undeniably, very best things in golf right now. This week’s he talks about his time trailing Johnny Miller's final broadcast, recycled YouTube clips, amazing tee markers and more. 7. Best Thing about Being on the NBC Golf Team The NBC gang does Saturday night dinners like the Corleones did Sunday suppers. The secret to Clemenza’s meatballs, as every student of the original knows, is fried garlic. An early Godfather script had Clemenza sautéing the garlic. But it was changed, and that made all the difference. (The shaft weight of your driver — that makes all the difference, too.) The key to the Saturday night NBC golf dinners is Roger (Maltbie) handling the wine list. These are social people. Well, not Johnny (Miller), but the others. Their Saturday night Phoenix dinner was in a private room at Ocean Prime, a heavy-cloth chain restaurant. There were 20 or so there, Johnny not among them. He flew home after his Saturday finale. But Paul (Azinger) was in the house. Paul’s a different creature. More social, for one thing. He now has a peculiarly important position. For millions of us, these people — Rog and Feherty and Rolf and Johnny for the past 28 years and now Paul — are our link to the game’s high priests, to the game as we aspire to play it. You could say the same of the CBS golf team. We don’t see these people as “TV talent.” They are golf people, dropping into our living rooms, week after week. Our attachment is real. That’s why we’re on a first name (or nickname) basis with so many of them. (Nod to Dottie and Judy, posthumously to Kenny.) Thanks, Johnny. Twenty-eight years. It went fast. Here comes Paul. Saturday night, he had the eight-ounce beef filet. Come Sunday, first day on the new gig, he was explaining Rickie and all that golfing oddness. 6. Best Recycled YouTube Clip In Phoenix, while in the booth at 18, watching Johnny’s final broadcast, Paul talked about how different his life would have been, had he not won the 1993 PGA Championship at Inverness. (Remember Inverness?) No ABC job, no FOX job, no NBC job. No Ryder Cup captaincy. You might not remember that his win came in a two-man sudden-death playoff, after Greg Norman missed about a five-footer for par on its second hole. Moments later, Azinger was telling Jim Nantz on live TV, “I was nervous, man — I really was. Literally, looking at putts, my heart was beating so loud I could see my eyeballs flashing.” The start of a second career, right there. 5. Best Tee Markers at the J.W. Marriott Phoenix. The NBC gang stayed at a J.W. Marriott with two resort courses, each named for its architect, the Faldo Course and the Palmer Course. 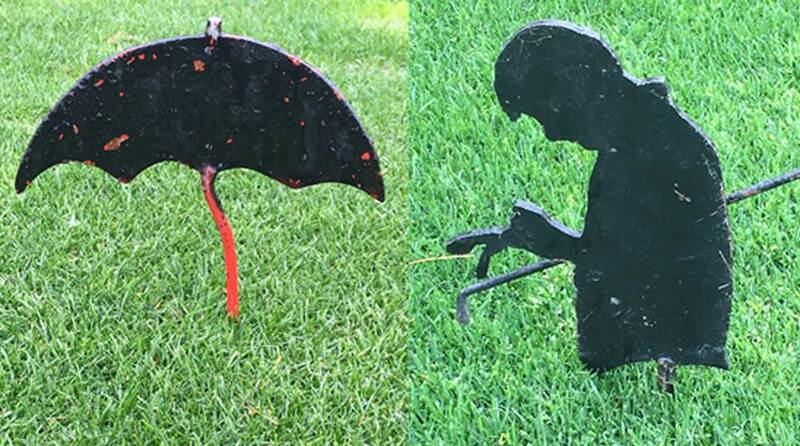 The tee markers on the Palmer course are steel umbrellas, the famous Palmer logo. The tee markers on the Faldo course are steel cutouts of... Faldo studying his yardage book (and paving the way for Bryson DeC). Surely, no resort guest of this fine J.W. Marriott property has ever stolen one of these markers, but if you were going to bring home only one, which would it be? I’m a certified Palmerophile, so it surprises me to say this: I’m going with the Faldo marker, in all its half-creepy oddness. The tee markers on the courses of the J.W. Marriott Phoenix are... unique. 3. Best Recent Note from a Housekeeper When you travel the Tour, in all its opulence — these days, the dessert offerings in Caddie Hospitality are outrageous — it’s easy to forget what life is like in the real world. Consider this thank-you note from a hotel housekeeper in response to a modest gratuity.